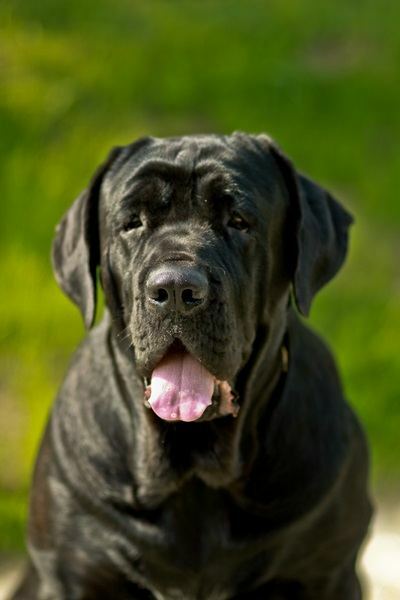 Bloat, or GDV, is a life-threatening condition that can affect large-breed dogs. Here's how to prevent it. Bloat in dogs is a condition where their stomach fills up with air and then twists and rotates out of place. It is often called Gastric Dilatation and Volvulus, or GDV. The filling up with air part is uncomfortable for the dog, but it is the rotating and twisting part that causes all the problems. When the stomach twists, it is devastating. The unlucky dog becomes very sick very fast. They retch, they vomit, they crash, and if they do not have emergency surgery they will die within hours. Even with surgery probably 30% of them do not make it. Bloat happens mainly in large dogs that have deep chests. Here is a list of the top ten breeds affected by bloat, listed in approximate order of occurrence. Great Danes are the most likely to develop bloat. It has been estimated that the lifetime chance of a Dane developing bloat is nearly 35%! That means that 35% of Great Danes will get bloat at some point in their lives. On the other end of the spectrum, the lifetime chance of a Rotty developing bloat is estimated at only about 5%. That means that 95% of Rottweilers will not have any problems with bloat. The other breeds fall somewhere in between. There is a surgical procedure that can be done to prevent bloat from occurring. This surgery permanently fastens the stomach to the inside of the body wall so that it can't rotate. This surgery is called a Prophylactic Gastropexy, or PG. The PG surgery can be done any time, but it is most commonly done when your dog is spayed or neutered. The PG surgery is not a minor procedure. In complexity, it is actually a little more complex the spay surgery in terms of invasiveness and time required. It is a bigger deal for males, because when it is done on a male as part of the neuter surgery, a whole new abdominal incision needs to be made. When it is done on a female being spayed, a longer incision is needed. Although it is not a simple surgery, it can be safely and effectively done at our clinic. If we are going to do the PG Surgery, we also need to do the best pain management we can do, and we need to have an IV line in place, so all the options you have been reading about are included in the price for PG patients. For females, the total price for the spay surgery and the PG surgery and all the associated medications is $474.87. For males, the total price for the neuter surgery and the PG surgery and all the associated medications is $458.29. Whether the PG Surgery is worth the cost depends on your risk tolerance. Most large breed dogs will never have a problem with bloat. However, if they do bloat, there is a high probability of death if not treated in time, and veterinary bills of $1,500 to $3,000 in emergency veterinary costs if they are treated in time, and even then about 30% of the treated dogs do not survive. Some would argue that it can makes a lot of sense to prevent problem that has a 5% to 35% chance of happening.